OBDII Function for all OBDII cars, not only Toyota, Lexus, Scion and Isuzu! Read Codes | Read generic (P0, P2, P3, and U0), manufacturer specific (P1, P3, and U1) permanent and pending Diagnostic Trouble Codes. Erase Codes | Erase generic and manufacturer specific Diagnostic Trouble Codes. Determine MIL | Turn off Check Engine Light (MIL) after clearing codes and reset monitors. DataStream | Read live PCM DataStream. View & Graph Live Data in Color Graphing and blazing fast refresh rate for better graphing and live data readings. Freeze Frame Data | When an emission-related fault occurs, certain vehicle conditions are recorded by the on-board computer. This information is referred to as freeze frame data. Freeze Data is a snapshot of the operating conditions at the time of an emission-related fault. I/M Readiness Test | Indicate whether or not the various emissions-related systems on the vehicle are operating properly and are ready for Inspection and Maintenance testing. O2 Sensor Test | This option allows retrieval and viewing of O2 sensor test results for most recently performed tests from the vehicle's on-board computer. Evap System Test | The EVAP test function lets you initiate a leak test for the vehicle's EVAP system. Before using the system test function, refer to the vehicle's service repair manual to determine the procedures necessary to stop the test. Battery test | Allows you getting the voltage of battery when the engine starts. On-Board Monitoring | This function can be utilized to read the results of on-board diagnostic monitoring tests for specific components/systems. Vehicle Information | Displays the vehicle identification number (VIN), the calibration verification number (CVN), and other information of the vehicle. Comprehensive Help | Including OBD Parameter, Mode Explanations, DTC search & More. 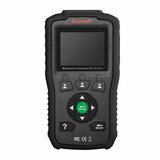 iCarsoft TYT V1.0 OBDII Function supports most of the OBDII/EOBD test modes including CAN, ISO9141, KWP2000, J1850 VPW and J1850 PWM. iCarsoft TYT V1.0 OBDII Function works on most of 2001 and later European OBDII compliant PETROL vehicles and most of 2004 and later European OBDII compliant DIESEL vehicles. 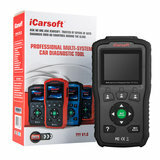 iCarsoft TYT V1.0 reads and clears trouble codes on most of the electronic systems such as engine, transmission, ABS, airbag etc. Applies to most Toyota, Lexus, Scion and Isuzu models which equipped with OBDII-16 DLC.